Big A little a: SBBT:Welcome, Mitali! A bright Good Morning to Mitali Perkins! Kelly: Tell us a little bit about Mitali Perkins. Where do you live? How do you spend your days? Mitali: Reading kid lit blogs. :) No, seriously, I'm still a mommy, even though our boys are (yow!) teenagers, so I drive around Newton, Massachusetts (our town), fold a bottomless pile of t-shirts and cargo pants, keep Trader Joe's in business, and chat and chill with my boys and their friends --when I'm wanted, that is. Mostly I'm on mommy-hold these days, waiting for an invite. I'm also a daughter who lives on the wrong coast, so I Jet Blue to California several weekends a year to stock up on home loving and cooking. Last but not least, I'm a minister's wife (double-yow!) so I co-lead a Bible Study and cheer on the hubby. In my spare time, I play tennis, tend the Labradors, and frequent Thai restaurants to gorge on cheapo extra-spicy lunch specials with various buddies. Oh, and professionally, I'm a writer, blogger, speaker, and reader. Mitali: I'm a one Diet Coke a day kind of girl; I sip it slowly until it's flat and warm. Mitali: I favor dead children's book writers--literary mothers like L.M. Montgomery, Louisa May Alcott, Frances Hodgson Burnett, Johanna Spyri, Maud Hart Lovelace, and others. When it comes to the living, I had lunch with Katherine Paterson recently, which was a dream come true. But in all the genres, children's fiction included, I tend to read broadly and widely; my skeptical soul likes to roam and listen to many storytellers instead of sitting at the feet of just one or two. Mitali: As an oft-displaced daughter of a harbor engineer, if I have any sense of place at all, it's the ocean. Instant cure for writer's block: a barefoot, solitary walk along the California coast at twilight. Kelly: What draws you to children's literature in particular? What I mean is, why children's fiction and not, say, mystery, chick lit, or "literary fiction"? Mitali: Latte in a handmade ceramic cup served by an artistic barista. I'm a Berkeley girl like you, remember? My husband's lattes are fabulous on a wintry afternoon by the fire. Kelly: First Daughter: Extreme American Makeover is the first in a series about Sameera Righton, a teen who becomes first daughter. How many books will be in the series? 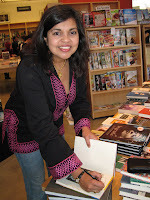 Mitali: The next one is First Daughter: White House Rules, and is due out in Spring 2008. Mitali: I like watching movies in my jammies with a snoring puppy on my feet. Mitali: That's easy. I'd give every village girl in Bangladesh the same opportunity I gave Naima, my fictional character in Rickshaw Girl (Charlesbridge, 2007), to escape poverty. If you want a more frivolous answer, I'd take my Dad to Wimbledon to watch the finals at centre court, lavish him and my Mom with five-star hotel splendour, and linger over Darjeeling tea, scones, and clotted cream. Mitali: No contest. After twenty-one years of marriage, my husband still puts in the effort to make V-Day a big romantic event and sweeps me off my feet every February 14th. Kelly: Blogs and social networking software play a big role in First Daughter: Extreme American Makeover--structurally and thematically. What implications do you see for Sameera (and for teens today) in that journals have become public--either to just 29 friends or to the world at large? Mitali: Persistent blogging, on-line journaling, and/or commenting can build community and give young writers venues to play with words and improve their craft. But as always (take the printing press, for example), the potential for good or evil depends more on the character and intentions of the people using new tools than on the tools themselves. Kelly: When you were writing First Daughter: Extreme American Makeover, I imagine it was difficult to choose a party for Sameera's father. Why did you decide to make him a Republican candidate? Mitali: So much of the money and power in the American storytelling industry is concentrated along the coasts. Is that why it's rare to find a teen book featuring Republican characters? I don't know, Kelly, but I like to remove labels and shatter stereotypes, so making Righton a "crunchy-nouveau-conservative" (and if you ask what that means, I'll make something up) seemed right, especially in a novel about politics penned by a "multicultural" Massachusetts writer published by a New York house. Kelly: One of the most touching and compelling moments in First Daughter: Extreme American Makeover is when Sameera's smalltown cousin, Miranda, glams it up for the cameras in tight clothing, makeup, and with an affected Smalltown accent. How will she do when she moves to Washington to live with the Rightons for an extended period of time? Mitali: Yes, indeedy, that's what a lot of book two's about; you'll get no spoilers from me, my dear. Ms. Rowling would be appalled if I told you what happens next. Kelly: You are writing a blog from Sameera/Sparrow's point of view--Sparrowblog--and are active on MySpace as Sparrow. How are teens responding so far? Are you ready for what will happen when the book is released? Mitali: Sparrow's site stats show a steady increase of visitors from week to week, but I wish I knew if they were teens, and certainly hope she starts getting more comments. On pub date, I'm giving away free books to the five libraries who've sent the most visitors to Sparrowblog via hyperlink. What's going to happen when the book's released? I have no idea, but I'm excited to introduce Sparrow to readers and vice a versa! Kelly: What can we look forward to next from Mitali Perkins? Mitali: I'll be blogging sporadically from odd places during the months of July and August as I travel across America and back with my family in a rented 29' RV. The labs are coming along; the ferrets can't as they're illegal in California. Professionally, Sparrow's sequel, First Daughter: White House Rules, releases in the spring of 2008 (Dutton) and a more literary YA novel will be published by Delacorte / Random House in the fall of 2008, tentatively titled The Secret Keeper. A major revision is due to Francoise Bui (editor of Monsoon Summer) on Labor Day. In 2009, Charlesbridge will publish The Bamboo People, the story of a Burmese boy soldier and the Karenni refugee he meets in the jungle. It's my first novel to feature a male protagonist (two, actually), and I'm going to be working again with editor Judy O'Malley. Whew. It's good to be working, that's for sure--if only the stress of deadlines sent me gym-wards instead of fridge-wards. Thanks for a fun interview, Kelly!